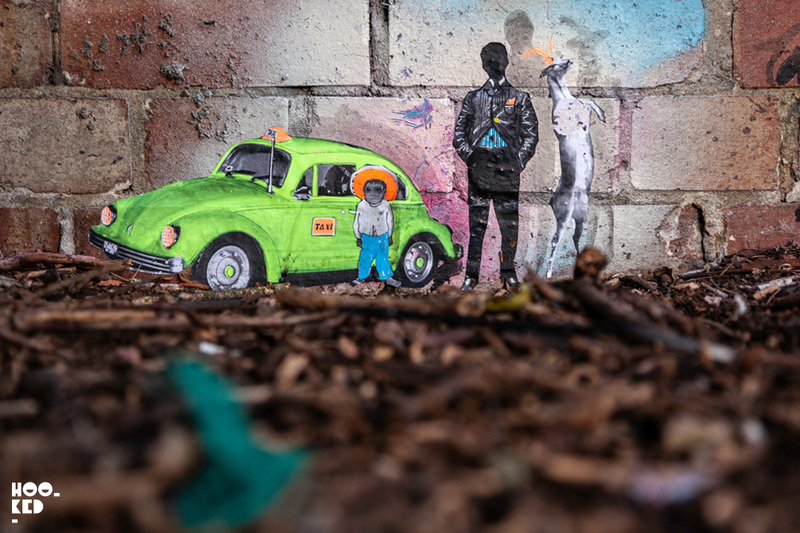 Mexican artist Pablo Delgado and master of miniature street art recently made a return visit to London. The one time London resident was back in the UK for a new solo exhibition of his studio work at an East London gallery. 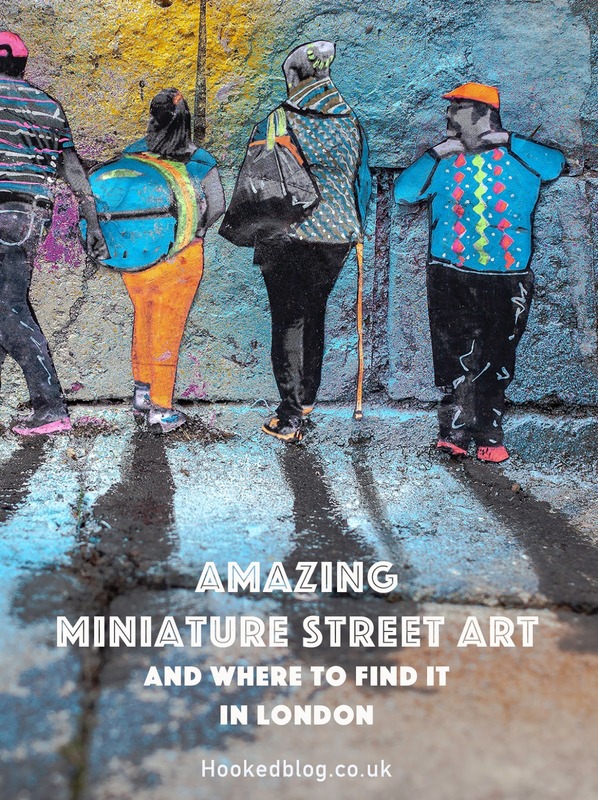 We got tipped off at the show opening that Delgado had been hitting the streets in the run-up to his exhibition and installing a new series of his much loved miniature street art pieces. 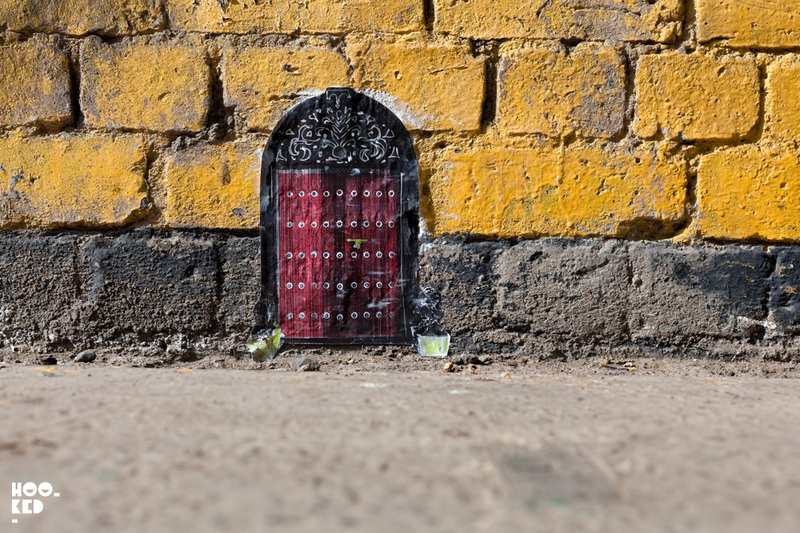 One of the 50 miniature street art doorways installed in Shoreditch in 2011 by Mexican street artist Pablo Delgado. 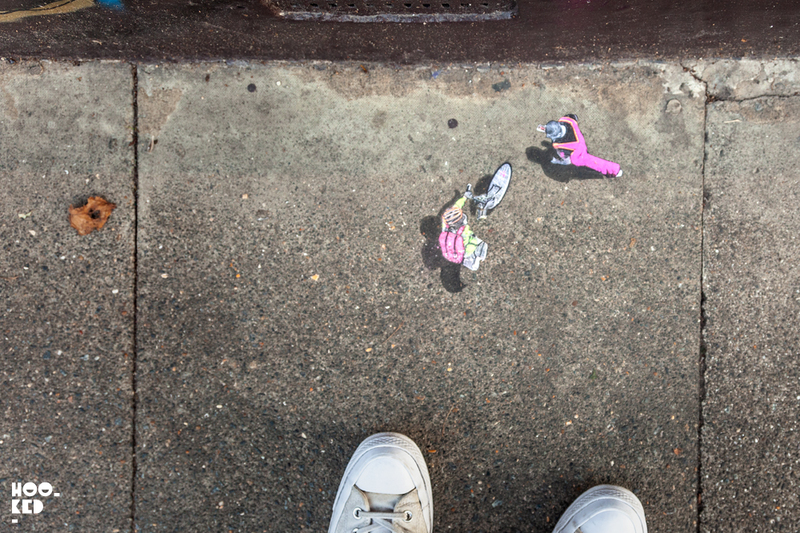 For those of you not familiar with the artists work, Delgado began putting up street artworks in and around Shoreditch around 2011 when he installed miniature paper doorways no more than a few inches high on the bottom of walls. 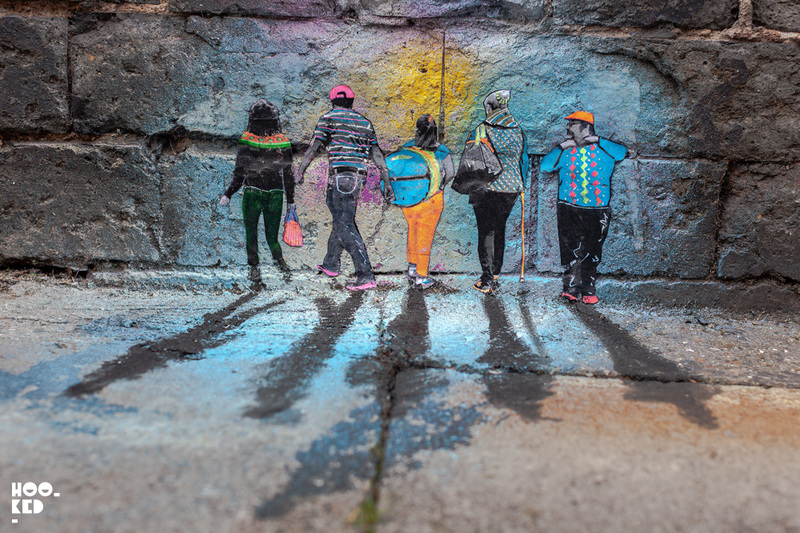 The various doorways were wheat pasted to the walls across the neighborhood and for a number of months street art fans seeking out the many of the near 50 doorways were curious as to the artist behind the works. 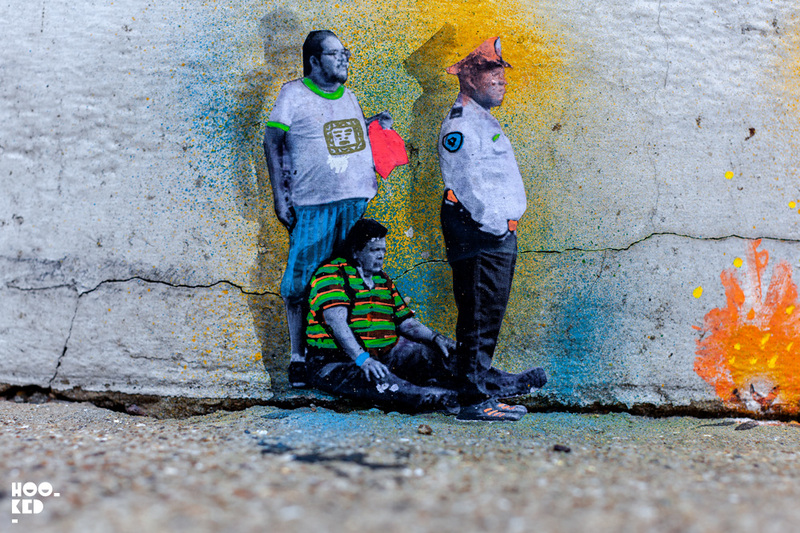 His fans didn't have to wait for long as his identity was revealed following Delgado's 2012 debut solo show at the Pure Evil Gallery in Shoreditch, London. An interview with the artist featured in The Guardian newspaper in 2011, Delgado spoke of his doorways and said, "I started downloading images of doors from around the world and I worked with them and pasted them on to some walls. It began because I felt claustrophobic at home. I live in a small place and see doors as an exit to a different world. These little doors give you more space for your imagination, the chance to wonder what's behind them." 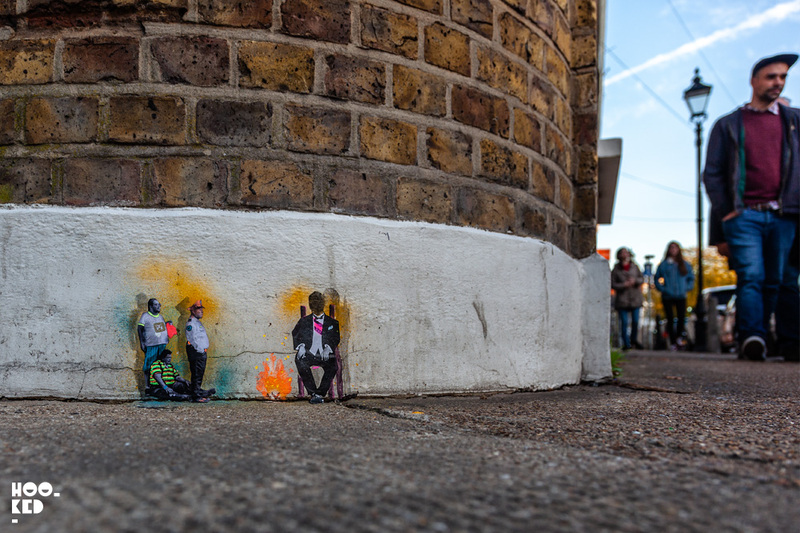 Following on from the 50 doors project, Delgado continued installing miniature street art around the streets of East London. 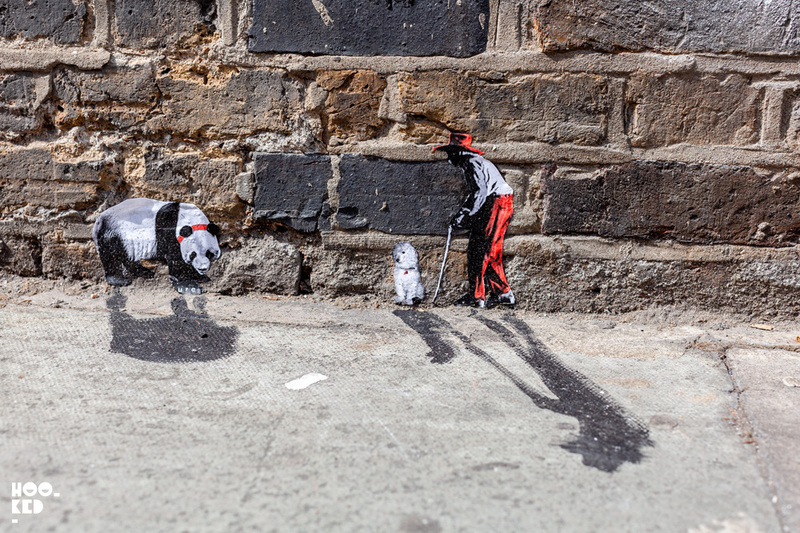 For his next series of paperwork, he installed combinations of tiny figures which he arranged into surreal scenes and compositions, adding elongated hand painted black shadows painted directly onto the pavements adding another dimension to the works. 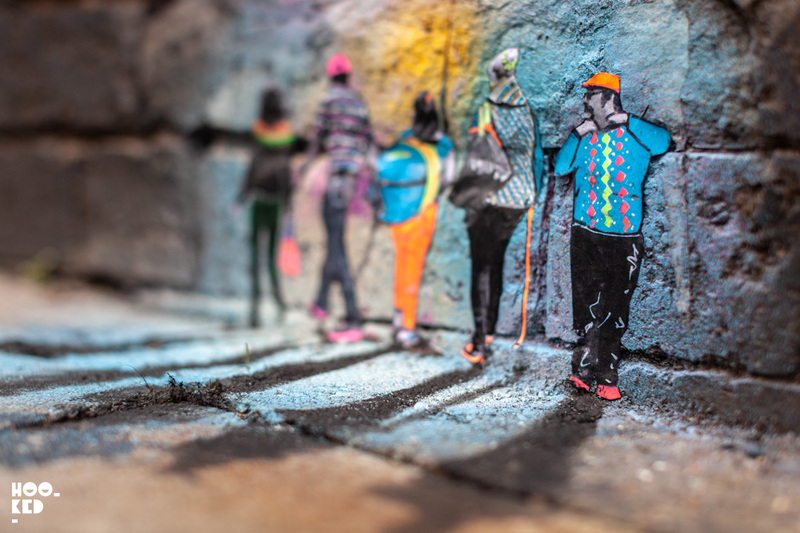 Delgado continued to develop his street work adding colour and textures to the walls enhancing the 3D aspect of his miniature paper works. Pictured above is a piece by the artists created as part of group show Banger Art curated by East London gallery Nelly Duff also in 2012. With Pablo Delgado back in London we took to the streets to see how many of the new works we could track down and photograph. With his solo show taking place in Columbia Road, it seemed like the right location to begin our hunt for the miniature paper works. After a cold afternoon pounding the streets and several coffees later we were happy to have photographed and found five works in the new series. We know there are a few more out there as Delgado has shared some additional works on his Instagram account - but we have yet to locate the rest of them. Should any of our readers have any tips or locations for the last few feel free to share the location with us in the comments section. 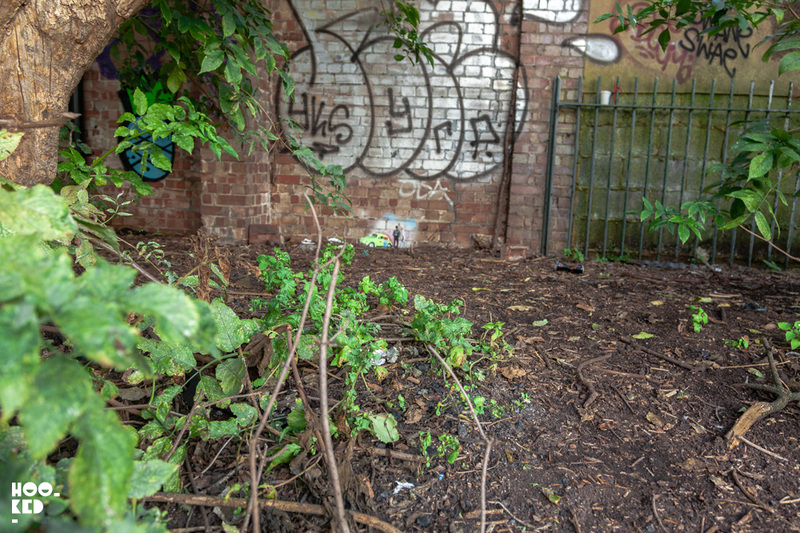 For Delgado fans out there who want to see the new street artworks in person, we have shared the locations below of the five works we have found to date. Should we locate any more we will update the post. 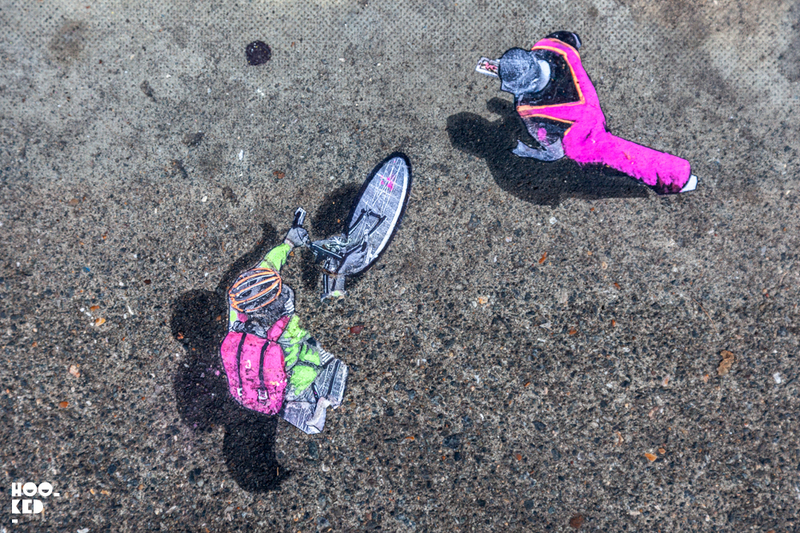 The first of the five miniature street art pieces we found, this one featuring five characters who like look like there are off on an adventure in search of hidden artowrks. These guys were located on Ezra Street just off Columbia Road in East London. 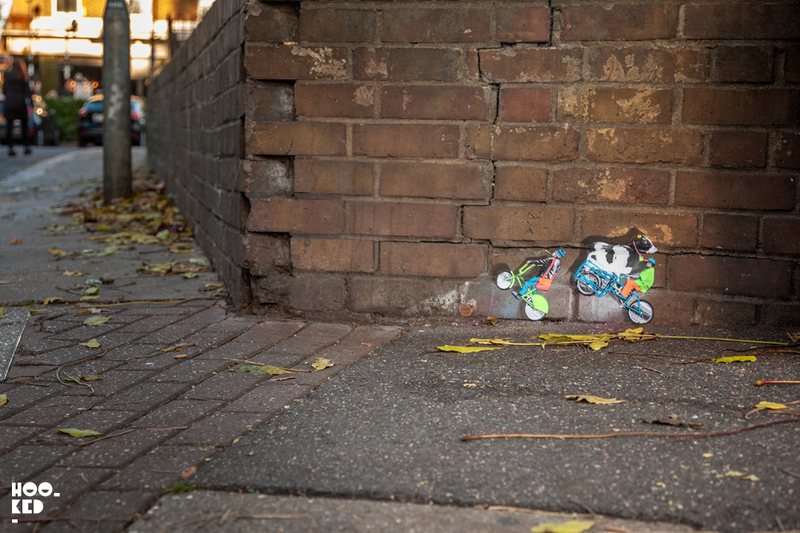 The second piece was one that we nearly missed as we were looking for pieces pasted onto walls and this was was pasted and painted directly onto the footpath. We felt like a giant towering over this wonderful piece, peering down from above on the tiny figures going about their daily routine, our trainers pictured in the photo above to give you an idea as to the scale of these fun works. Location: Columbia Road. Outside the Nelly Duff Gallery. 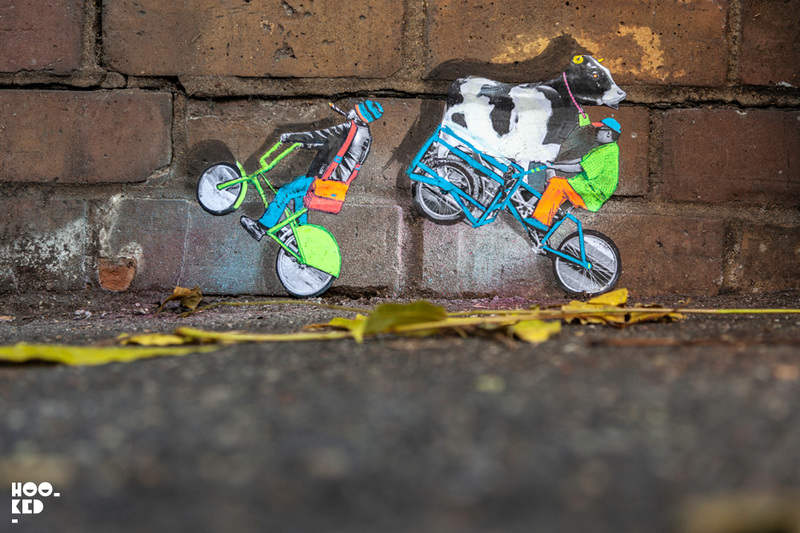 A common sight in East London, teens wheelie-ing around the city on the many rental bikes that started to appear across London - not such a common sight are cows let alone a cow hitching a ride on a bike!! The third weird and wacky piece from Degado reminded us of some of the characters that featured in his earlier works. 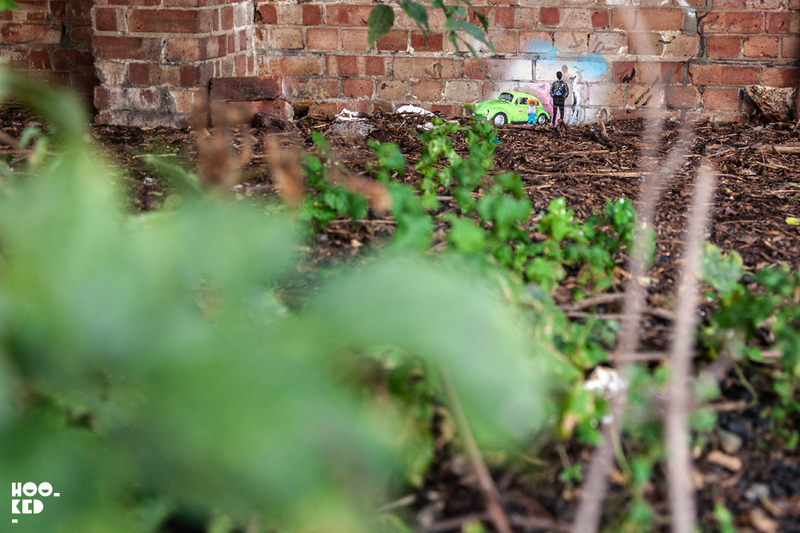 This fourth piece took some time to track down as it is hidden behind some hedges in a park. But if manage to find the new large-scale black and white mural by artist Phlegm on Hackney Road you will find this piece dwarf by the huge mural on a wall opposite. Location: Ion Square Gardens / Hackney Road opposite the Phlegm mural. The fifth and final piece from our day of street art hunting but hopefully not the last one we find from this new series. 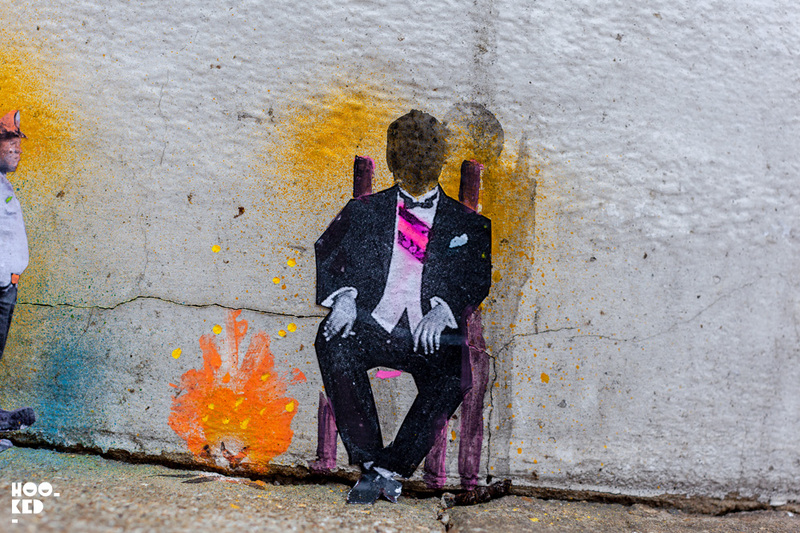 These firestarters were also hanging out just off Columbia Road. Location: Barnet Groove / Baxendale Street corner. We spent a number of hours tracking down the new works by Delgado as we didn't have any of the locations (plus we stopped for many coffees), should you want to photograph and see the new works yourself they are all within walking distance of Columbia Road and should take more than 30 minutes to see all the new works pictured above. 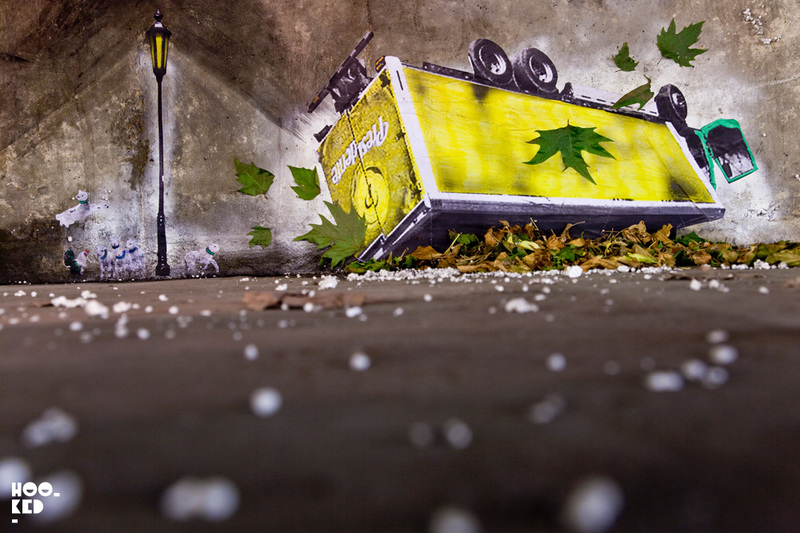 Pablo Delgado hits the street of London. Pablo Delgado Solo Show at Pure Evil Gallery. Loving this post feel free to share if you are on Pinterest.